Why Do Wild Bees Matter? Our wild bees (and indeed other pollinators) are SO IMPORTANT. Yet many pollinating species remain unsung heroes of the environment, gardens and countryside. I campaign for solitary bees, bumblebees and honey bees. Many of the actions we take to protect one pollinator species – whether it be honey bees or wild bees, (such as flower rich habitat creation, protection from pesticides), will assist biodiversity as a whole. However, I do feel dismayed when I receive comments and criticism for this approach. Why? Well there are those like me, who can see that all the bees and other pollinators are important. On the other hand, I’ve had people contacting me to say that honey bees are more important than the rest, whilst others insist that wild bees and pollinators would be better off if honey bees were allowed to die out. Now with regard to the second point, for those who think honey bees are a nuisance and should be allowed to die out, then I suggest you read my page about why honey bees matter (opens new window) for an alternative perspective about this enchanting little pollinator. I have also written a page about some of the problems faced by wild insect pollinators (see the link at the bottom of this page). Many species of moths, butterflies, beetles and so on, are having a very hard time too, which is bad news, because they all play their own vital role in the web of life. This page is written to put the case for wild bees. In the same way that I have defended honey bees from those who argue they should be left to die out, on this page, I will counter the argument that only honey bees matter, whilst wild bees do not. I’ll use some of the broad-brush statements people have actually made to me as a basis upon which to address this issue. 1. "In a colony of honey bees, there may be about 50,000 to 60,000 workers. Because there are so many, they therefore provide greater pollination coverage, and so are far more important than bumblebees and solitary bees". This sounds plausible, but it is actually wrong! - The speed at which the bees work is a key factor. According to the U.S. Department of Agriculture researchers, a study by Bosch and Kemp, 2001 revealed that only 250 female blue orchard bees (Osmia lignaria) are needed to pollinate an acre of apples, that would usually have required the service of one to two honey bee hives, with 15,000 to 20,000 workers in each. -	Under the same conditions, bumblebees actually pollinate more flowers per bee than honey bees (from: Bumblebees Behaviour and Ecology; Prof. Dave Goulson; citing Poulson 1973; Free 1993). - In some cases, pollen is not simply brushed off from anthers onto an insect body. This means that although an insect may visit a flower to forage on nectar, they will not necessarily pollinate it. 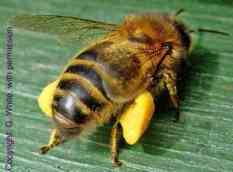 Honey bees are unable to ‘buzz pollinate’. Bumblebees manage this by vibrating their flight muscles, thus shaking the pollen from the anthers. -	Some flowers require ‘tripping’ in order for pollination to occur. For example, with Alfalfa, two petals hold the stamen which holds the pollen-bearing anthers. When visited by bees, this ‘triggers’ the stamen to spring forth, enabling contact with the bee, and transfer of pollen. However, this triggering mechanism has been found to discourage honey bees, which, apparently, learn to avoid this triggering by approaching the flower from behind, thus enabling them to gather nectar but not pollen. 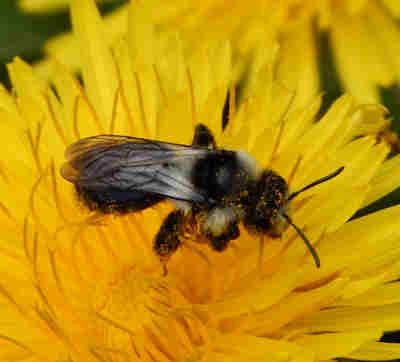 Other bee species – especially solitary bees of the megachilidae family, are not put off by the triggering process, and are particularly effective for pollinating alfalfa. -	Honey bees have short tongues in comparison with other longer-tongued bees, such as some of the bumblebee species. This means they are not so keen to visit deep flowers (Goulson). - Some studies (such as Corbet et al 1993) state that some bumblebee and solitary species make better pollinators during adverse weather conditions, such as cooler weather. 2. "But honey bees are the primary pollinators for crop pollination, and therefore they are more important". It is true that honey bees are primarily used in commercial pollination, but this is due to man’s domestication of the species, and lack of knowledge about the importance and sometimes greater efficiency of other pollinators of some crops. However, increasingly, other bees are being reared for commercial pollination, but this is a relatively recent development (and one I am not so sure I’m keen on!). Nevertheless, as an example, the efficiency of bumblebees in COMMERCIAL pollination of tomatoes, was not even discovered until the 1980s. It was discovered in the Netherlands, where several companies began rearing Bombus terrestris. Within 3 years, 95% of tomato growers in the Netherlands had switched to bumblebee pollination. (Source: Bumblebees Behaviour and Ecology; Prof. Dave Goulson). 3. "Honey bees are more important, because they provide honey, wax and so on"
It is true that humans harvest a number of products from honey bees such as honey and wax. I have to say, I think honey bees give and give and give. I would even add to the list: honey bees have provided much inspiration for humanity, such as the use of hexagons. It is also true that other honey bee products have been exploited by man, such as bee venom, and also honey bee pollen (the supposed advantages of which I remain unconvinced about). However, some crops are only pollinated by wild bees and other pollinators, and not honey bees. Some of these plants provide important products and/or food for humans. 4. "I read that honey bees pollinate nearly all the wild flowers in the countryside"
In some countries, the honey bee species is not native, and so it is unlikely any native wildflower flora have evolved with honey bees in mind as the pollinator! Although there may be thousands of honey bee colonies in a country, they are limited in distribution by the movement of beekeepers. Honey bees will only fly within a radius of 3 to 5 miles to forage for food (although some sources state 12 miles). So which species are doing the pollinating, when honey bees are not present? In the UK, perhaps it is one of the other 250 species of bee, or maybe hoverflies, butterflies, moths, and beetles have a role to play, not to mention wasps! (This year, I filmed wasps pollinating my cotoneaster tree, resulting in ample berries for birds this winter!). Meanwhile, feral honey bees may be few and far between. 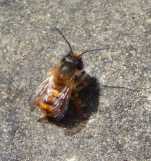 It is thought there are very few wild honey bees in the UK and USA for example. As stated before, some species are more efficient at pollinating particular flower shapes. Honey bees have short tongues. This limits the types of flowers they will visit, where as a number of wild bees species have longer tongues. For example, some deep and 'complicated' flowers, are favoured and pollinated successfully by bumblebees, rather than honey bees. In addition to which, bumblebees are able to buzz pollinate, which has made them invaluable as pollinators to ensure better crops of plants such as tomatoes. 5. "Bumblebees get too much attention, because they are cute and fluffy, whereas honey bees should receive more attention"
It’s true, I actually received this message via social media! I attempted to reassure the person that this simply was not the case. As of today, a search for ‘honey bees’ in Google produces 2,280,000 results – many of these mentions being from online, mainstream newspaper articles, as well as blogs, campaigns, websites and so on. Even many high profile campaigns by commercial and voluntary organisations tend to focus on honey bees without mentioning wild bees, despite their plight and importance. Oh, and a search for ‘honeybees’ (all one word), produced a further 1,790,000 results (although I do not know if some of these were included in the original 2.28 million). Meanwhile, a search for bumblebees on Google produced 949,000 responses. 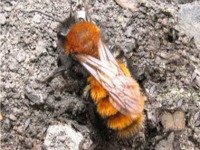 And solitary bees, which consists of the major portion of wild bees, and relatively speaking, ‘our unsung heroes’ – produced only 227,000 returns from Google. I think this provides a useful indicator of which species is grabbing most of the attention. Whilst I am keen that honey bees are helped, it is VERY IMPORTANT to realise that solving honey bee specific problems, such as varroa, and increasing the number of beekeepers, does not mean that all is well with our pollinators, but I fear that many will think this is the case. 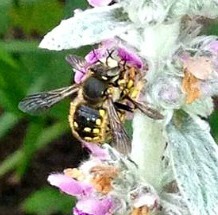 Indeed, more needs to be done to raise awareness of the problems faced by wild bees and insect pollinators generally. Finally, as an example, there are thousands of beekeepers in the UK, actively managing and caring for their bees on an ongoing basis, and supported by associations. Meanwhile, the invertebrates charity, Buglife, consists of a team of about 15 employees, looking out for the whole of the nation’s invertebrate species, including bees, ants, spiders, beetles, butterflies, moths, and many other creatures we are generally oblivious to. Government funding for bee related matters is already inadequate, but most of it has tended to focus on honey bees, rather than wild bees. Meanwhile, I have concerns about the commercialisation of wild bees as pollinators, and I find myself fearing 'Where will it lead?'. We have already tampered with honey bees over centuries, many would argue, to the desires of man but to the detriment of the honey bees themselves, especially in terms of health. Mistakes have already been made in the USA, with the shipping around of bumblebees into new locations, and the spread of disease to local species that have not naturally had the time to build up a resistance to the new disease. I think we need to get better informed and re-look at our land management practices, before we develop further risky practices such as this. 6. "Honey bees are more important because they can be managed"
Increasingly, wild bees are being reared and ‘managed’. On my page Why Do Honey Bees Matter, I outline how important this is for humans in terms of monitoring environmental stressors. I cannot stress the importance of this (nor my love for this enchanting little creature) - enough. However, I believe it is important to remember that whilst honey bees may be managed, the diseases and problems experienced by honey bees, the collapses in populations, combined with the fact that we are becoming more aware (albeit very slowly) of the importance of other pollinators, indicate that is is very unwise to neglect, ignore and allow destructive practices towards other wild bees and pollinators. Relying on only one species for pollination, would seem foolish and detrimental to food and environmental security. Some people have the habit of viewing life in terms of competition, then transferring those values to wildlife. But nature can balance itself out beautifully, and I think it’s more helpful for all parties to work together to protect all the species. All of wildlife plays a role – there are no superfluous species, even if we think there are – just our lack of understanding. And again, for those who may feel enraged at my support for wild bees, take a look now at my page about why honey bees matter. Bees are not the only pollinators. In some countries, bats and birds may play a role, but on this page you can read more about other pollinating heroes of the insect world, and their status. More information about bee pollination, looking at the different types of bees. Why are our bees going missing? Learn about some of the causes of the problems faced by our wonderful bees. Check out these 10 simple things you can do to save the bees, and spread the word to your friends and family.